A car accident would have been bad enough, but the crash that you were involved in is more complicated and potentially devastating. You were hurt by a negligent driver, but the driver who caused your crash did not stick around to take responsibility. Instead, the driver chose to leave the scene of the crash and to leave you as a victim of a hit-and-run accident. Why Did The Driver Leave? Was under the influence of illegal drugs. Did not have a valid driver’s license. Did not have permission to drive the vehicle. Typically, you won’t know what caused the driver to leave the scene of the crash until a full investigation is conducted after the collision. Call 911. Report the accident and tell the emergency operator that the other driver left the scene of the crash. The police and medical first responders should be dispatched immediately. Record any information that you can about the vehicle. This could include the license plate, the color and make of the vehicle, or any other identifiable information. Record witness information. This includes the names, addresses, phone numbers, and email addresses of anyone who saw the crash occur. This can be vital to confirming the identity of the driver and other details of the crash. Accept medical help. 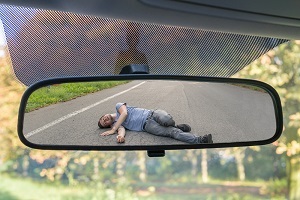 Some accident injuries may not be readily apparent. Therefore, even if you feel okay after a crash it is important to see a doctor as soon as possible. You should not, however, chase after the other driver. This could put you at additional risk of physical harm. Sometimes, these actions will be impossible to take at the scene of the crash. For example, you may be too hurt to take action. That is okay. It does not mean that you will have to forego a fair recovery. Instead, it becomes even more important to get a copy of the police report from the crash and to contact a car accident lawyer as soon as possible. The state of Texas may pursue criminal charges against a driver who leaves the scene of an accident. The driver may be charged with a misdemeanor or a felony that may result in a significant fine and jail time. A criminal case, however, will have no impact on your potential recovery. The other driver, if that driver is eventually identified. The other driver’s insurance company, if that driver is eventually identified and carries valid insurance. Your own insurance policy, if you carry uninsured motorist coverage and the other driver is either uninsured or is never found. Even if you pursue a claim against your own insurance company, you should not expect your insurance company to be on your side. Instead, the insurance company becomes an adverse party that wants to pay you as little as possible for your claim. Accordingly, it is important to work with a car accident lawyer who can protect your rights with your own insurance company, with another insurance company, or with another driver after a hit-and-run crash. Please schedule a free, no-obligation consultation with us as soon as possible to learn more about your legal rights and about protecting your potential financial recovery.